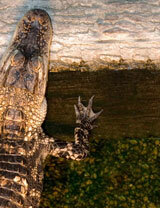 You are Here : Home > Visit a Farm > Louisiana "Visit a Farm"
Watch in amazement as giant alligators feed, wrestle and swim! Located in Northwest Louisiana, just 10 miles from Shreveport, LA, in the Ark-La-Tex. It's a great place for a weekend visit and close enough for a weekday jaunt! Your kids will love it, and so will you! In addition to the huge reptiles - a fully stocked petting zoo where you and the kids can walk among tame and cuddly miniature horses, kangaroos, ring-tailed lemurs, deer, coatimundis, goats, llamas, a camel, a capybara (the largest rodent in the world), and even a Scottish cow! Situated on a working 75-acre farm one hour from the French Quarter of New Orleans, Splendor Farms Bed & Breakfast offers comfortable, family-friendly B&B accommodations in a relaxed country farm setting. We have 3 guest bedrooms, a guest bunkhouse, swimming pool, horseback riding, a dachshund kennel, a petting zoo, and nearby hiking, biking, and nature trails. At Red Bluff Farm we proudly offer our visitors a three hour educational tour that introduces the wide variety of farm livestock and crops. Red Bluff Farm provides an exciting learning experience for grade-school children and adults in Louisiana. The corn maze is located in Pine Grove, La on Hwy 16. The maze is located 1 mile east of 42360 (Napa Auto) in Pine Grove, and five miles west of 35999 (Bear Creek Western Store) in Montpelier, La Our family has been farming for thirty years, raising soybeans, corn, wheat, oats and grain sorghum in Baton Rouge. The Maze at Cajun Country Corn provides good wholesome family oriented entertainment in a farm setting.